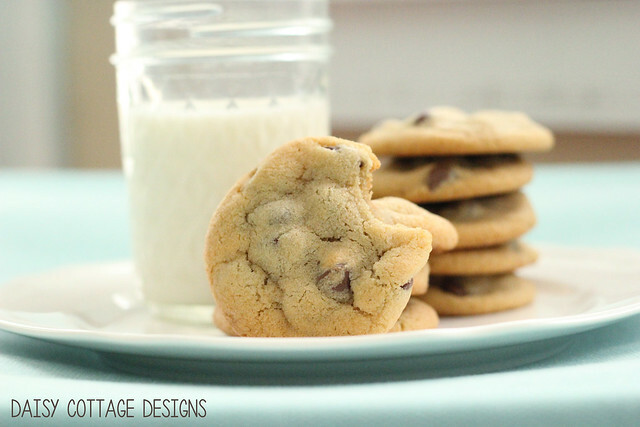 Who doesn’t love finding perfect chocolate chip cookie recipe? This easy chocolate chip cookie recipe produces results that are better than Toll House – I’m not even kidding. A little crispy on the outside and deliciously chewy in the middle. Want to know my easy recipe? Stay with me and we’ll get there. I’m not going to lie. My husband and I eat chocolate chip cookies way more than we should. We like other desserts and/or treats (like these easy muffins), but chocolate chip cookies are definitely our go-to. I’ve tried tons of recipes. I’ve used this award winning chocolate chip cookie recipe and I’ve tried a gourmet recipe or two. Even so, this is the only recipe I make now. Want to impress your friends and have them begging you to bring cookies to every event? Ok, good. Here’s how you can do it. Just make sure you’ve got a high-quality pan on hand like this one. First things first. Preheat your oven to 350˚. In a large bowl, cream together butter, white, and brown sugar. Mix in eggs and vanilla. Combine baking soda, salt, and flour in a separate bowl. Stir into wet ingredients. Add flour until the mixture isn’t sticking to the sides of the bowl (I generally use 2 1/2 cups plus a sprinkle more). Fold in chocolate chips. To be totally honest, I use a fork and mix these by hand 50% of the time. If I feel like dealing with less cleanup, I just use a fork and they turn out just the same, in my opinion. Roll into balls and place on an ungreased baking pan and bake for 9-11 minute (10 is perfect in my oven) or until the cookies are a light golden brown. The batch makes approximately 48 cookies (but this depends on how much dough you eat… not that I eat any cookie dough or anything). If your cookies turn out so beautifully that you decide to take some photos, be sure that you guard them carefully. Little hands (and big ones, if there are any around) will probably attempt to swipe a few. If your cookies are turning out flat, you need to add a little more flour to them. Adding extra will prevent your cookies from falling and looking very flat. The pan is definitely very, very important. Your cookies won’t be the same if you don’t use a high-quality pan. I made this mistake a lot when we were first married and thought I wasn’t a very good cookie maker. Then I started using pans that I inherited from the previous owner of my house (she was like my grandma), and the cookies were amazing! Now, I use this pan. It’s huge and lets me bake 20 cookies at a time. I think this sounds like somthing I might do today!! Yummmy!!! These look SO good! Chocolate chip cookies are my favorite…when I don&#39;t end up eating all the cookie dough before they go in the oven. I&#39;ve got these in the oven right now…they smell delicious! Thanks for the recipe! I am going to make these right now! Just a question about your abbreviations. Does t. stand for teaspoon or…? Thanks! Mrs. W -<br />t always stands for teaspoon in a recipe, while T stands for tablespoon. I just made these- I have tried 100 different chocolate chip cookie recipes and this is likely the best one (besides the jacques torres cookies that take 3 days to make). These are great!!! Thanks for the recipe, I&#39;d highly recommend it to anyone. I made these but found them very salty. A teaspoon of salt seems like a lot of salt for cookies to me. If I make these again I will use a lot less salt. Maybe you used salted butter? One t of salt is pretty standard issue. If you used salted butter that would up your salt level. Maybe try it w/o salted butter if that was the case? I just made these and they flattened after they came out of the oven. The only thing I did differently was use 1 tsp of vanilla instead of 1/2. Would that do it? I’m so glad! I make them all the time! Best cookies I’ve ever had!! I added more vanilla than you called for, and safe to say it was AMAZING! I add some extra vanilla from time to time, too! Mine never seemed to not stick to the side of the bowl.. what makes I doing wrong? Hmm. How much flour have you used? Some people have used up to 3 cups. I was wondering did you put a total of 4cups of flour? Or just 2 1/2¿ ik confuse because this ia going to be my first time making cookie. I just made a batch of these and my wife told me they look perfect. Best of all, they are really yummy. I’ll be making more of these throughout the winter I have a feeling. Thanks ! What temp do you bake these at??? I love this recipe! Thanks a bunch! I linked your recipe in my blog that I have just started. Thanks so much for the inspo!